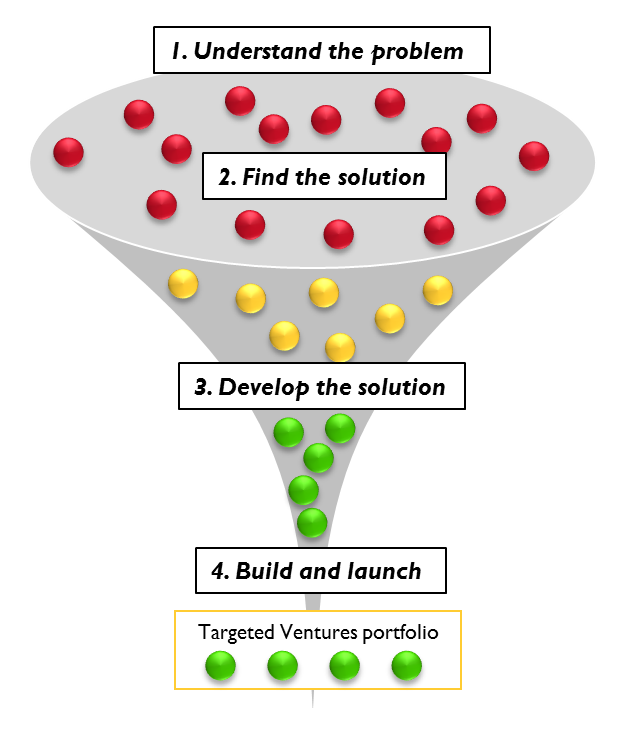 Our targeted ventures is our issue driven approach: we begin by understanding what the problem is and then develop innovative solutions to address this. 1. Understand the problem: We work with local authorities to understand the most pressing challenges they are facing and we use this to define our problem areas. 2. Find the solution: We collaborate with a range of stakeholders to generate and develop a long list of innovative solutions to address these problem areas. 3. Develop the solution: The long list of solutions is critiqued by our subject matter experts and our governance board and from this, we agree which solutions will be taken forward to business plan stage. 4. Build and launch: We develop the shortlist of solutions into high level business plans, which are used to inform the governance decision as to which solutions join the portfolio.The chosen solutions are built and launched through collaboration with industry and local authorities. Our first cycle of targeted ventures focussed on Homelessness, Housing and Temporary Accommodation. Cycle two is addressing the challenges around Children and Families. To find out more download our latest Targeted Ventures progress update. Our targeted ventures work complements our venture partner portfolio, which uses market ready solutions to address a wider range of issues facing London local authorities. We are in the 'develop the solution' phase of cycle two. We have engaged with local authorities, policy leads, third sector and private sector organisations through a variety of events to find and develop the solutions to the challenges children and families face in London. Read about all of the events on the Targeted Ventures latest news, updates and blogs page. To find out more visit our Children and Families page or download our Children and Families Prospectus. We will be further developing and refining the solutions through our Young People Panel and our Dragon's Den in early 2019. Following this we will continue to engage with local authorities, central government, social enterprises, charities and innovators in order to test our solutions and identify sponsors for them. …businesses interested in delivering these exciting new ideas. If you would like to be involved or want more information, please get in touch. Early identification of those at risk of homelessness: Uses data and predictive analytics to identify households most at risk of entering homelessness. Enables local authorities to target earlier intervention and prevention as well as monitor the efficacy of the interventions made. Pan-London Accommodation Collaborative Enterprise (PLACE): Local authority owned modular units to be procured on a pan-London basis for use as affordable temporary accommodation. Units can be placed on non-permanent sites and re-located as necessary. Transition Insurance: an insurance product to reduce the upfront costs of living in the private rented sector. It removes the need to pay for cash deposits when placing tenants into the private rented sector and replaces it with a monthly premium. This reduces cost per tenancy and prevents homelessness occurring, enabling more people to live in a home of their own. London-wide temporary accommodation platform: a pan-London property listing platform for local authority use, listing all properties available for temporary accommodation. Increases visibility of options available and enables placements to be made faster. You can read more about these projects in our latest Targeted Ventures progress update. Sign up to our newsletter on the right of the screen. Check out our targeted ventures news page for the latests blogs and updates.